Readers of All and Everything, Beelzebub's Tales to His Grandson are met from the outset with what seems like a labyrinth of words undulating riotously in a profusion of ideas, perspectives, insults and asides. And so from the very beginning Mr. Gurdjieff challenges the reader's sincerity of interest, demanding a directed, not captured, attention. The book, a Legominism, that is, "the means of transmitting information about certain events of long-past ages through initiates," has three layers. The first of which is "To destroy, mercilessly, without any compromises whatsoever, in the mentation and feelings of the reader, the beliefs and views , by centuries rooted in him, about everything existing in the world." This assault is unflagging The result is, if the reader submits, all the artifices of the knowledge he thinks he has about himself and the world will be stripped away. What is left is his quality of mentation alone. Why? Because only then will he truly be able to learn and grow. What is not generally understood is that there is a payment to be made for any genuine transformation. The payment is made in terms of one's time, energy and attention. We give it so easily to our daydreams and our personal life, but when it comes to the study of oneself in the persistent reading and rereading of All and Everything resistance arises. We are used to a book capturing our attention, letting us escape into its images. Gurdjieff confronts us with the meagerness of our attention and lack of will. If we accept this and patiently struggle on, not only will our attention and will increase but also a new perspective will be born. Many, unfortunately, will give in to their resistance. The writer recalls years ago having left his umbrella on the subway and going to the lost and found to hopefully retrieve it. On the desk was a copy of All and Everything. When the clerk returned, my umbrella in hand, he saw me thumbing through the book. "What is it about this book?" he asked. "Come here," he said, and motioned me into the storeroom. A whole wall was lined with copies of Mr. Gurdjieff's Legominism. "Must be the hardest book to read in the world," he said, laughing. "Everybody 'loses' their copy." The interpretation that follows, certainly not definitive, is offered in the hope that those who "lost" their book might become interested enough to give it another chance. Having thus begun, let us first note the chapter could have been titled "The Lawful Result of Impartial Mentation." But instead Gurdjieff chose the word Inevitable, which means the same but evokes an emotion, and hence more force. Gurdjieff's beginning this last chapter of the Legominism with Beelzebub as its first word, adds even more force. And the last words of this first sentence tell us that "everything was suddenly lit up with a 'pale blue something.' "So Beelzebub, like everything within the spaceship Karnak, has changed color to pale blue. Later, we will find that Beelzebub becomes orangethe sacred rod which is the channel by which his horns are returned emanates the color orangeand, at the chapter's close he becomes pale yellow. It is at this point when Beelzebub's grandsonall references to Beelzebub are now capitalized as "His," "Him," "Your," and "Himself"asks Him a last question of what would be said to our ALL-EMBRACING UNI-BEING-CREATOR concerning the possibility of saving the three-centered beings of the planet Earth by directing them "into the becoming path." Simultaneously 'something' pale yellow began little by little to arise around Beelzebub and to envelop Him, and it was in no way possible to understand or to discern whence this something issuedwhether it issued from Beelzebub Himself or proceeded to Him from space from sources outside of Him. The answer Beelzebub gives to Hassein each reader should ponder for himself. Returning to the chapter's beginning, we see that several archangels, a multitude of angels, cherubim and seraphim meet with Beelzebub's tribe in the main hall of the spaceship Karnak (the name calling up the great temple complex in ancient Thebes). Gurdjieff observes that these two groups are not the same but are "differently natured three-brained beings." What is this nature? Has the angelic ever been portrayed with horns? And what are horns? For a preliminary exposition, see TGJ #27, "Horns of Being." Regardless of difference, the angelic and Beelzebub's tribe jointly sing the "Hymn to our ENDLESSNESS" which, we are told, is sung on such occasions everywhere "by beings of all natures and all forms of exterior coating." As the two different natures spoken of are both three-brained beings, and in an earlier chapter we are told that the difference between human beings and Beelzebub and his tribe is that we are two natured and they are one, it would be supposed that the angelic are also one-natured. Passing beyond this, what is our ENDLESSNESS like? The Hymn gives some core attributes such as "Long Patient," "Abundantly loving," the "CAUSE Of All That Exists," and the "Unique VANQUISHER Of The Merciless Heropass." So He is patient, loving, creative and a warriora Vanquisher of Time. We are told, too, that everything that breathes is a maintainer of the Universe on its level and in so doing extols the MAKER-CREATOR. The word "merit" is voiced in the Hymn and it will be used several more times in speaking of Beelzebub. To this reader's ears, when the word is first used by the venerable archangel it has a certain loving but sly undertone. He tells Beelzebub that a pardon has been granted to him from Above "and for certain of your merits." Is this a reference to what we read in Chapter II about Beelzebub's "as yet unformed Reason due to his youth" which gave him a "limited understanding" in how he saw the governance of the World and so it seemed to him "illogical"? He therefore rebelled and was exiled, hornless. He and his kinsman settled on the planet Mars, and as an earlier chapter tells us, it is soon after the birth of the planet Earth, as it was still in a cooling stage. Beelzebub, therefore was an eyewitness to all that subsequently took place. Instead of brooding, he made an active exploration of Ors, making several excursions to Saturn, as well as six descents to the planet Earth. He lived a life of merit during his long exile. (In human time, he resided in our solar system some 14.6 billion years before a pardon was granted.) The number of horns he previously had is not known, but he now receives an awe-inspiring five horns. This means Beelzebub has attained the Reason of the sacred Podkoolad, which is "the last gradation before the Reason of the sacred Anklad," only "the third in degree from the Absolute Reason of his ENDLESSNESS HIMSELF." We understand now that impartial mentation has within it many degrees, each sacred, others being Degindad and Ternoonald. 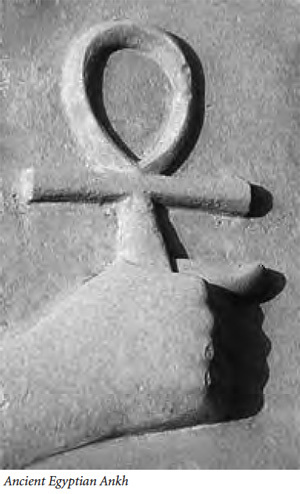 The sacred Anklad brings to mind the ancient Egyptian Ankh, the symbol of eternal life as well as the word for physical life. In the Egyptian creation story the god Atum emerges from the vast watery darkness of the deep called Nun onto a Primeval Mound from which he creates the gods, an ennead of nine gods, each being a manifestation of his creative powers, and every living thing. In the Memphite creation story, the creator is named Ptah and is located in the Heart and Tongue, one the seat of intellect, the other the weapon of creative power. In essence, what Gurdjieff is giving is a more detailed account of how creation came to be and how the very creation, and even the Sun Absolute (the Primeval Mound) itself, was threatened by the merciless Heropass. A deep lesson of this chapter is the way Beelzebub's horns are restored. Active elements are channeled through the sacred rod having a ball at its end (one might conceive something like an ankh). The glowing orange rod, one of four in the Universe, is the sacred rod of the Archcherub Peshtvogner, one of four cardinal All-Quarters-Maintainers. As Beelzebub kneels before him, the venerable archangel puts the "chief end," the ball, over his head, pointing the opposite endas every stick and spine has two endstoward members of Beelzebub's tribe. Previously, the venerable archangel has informed the tribe that those who wish to do sothe act is purely voluntarycan touch the sacred rod and, depending on the length of time touched, an equivalent amount of active elements will "pass from your own horns for the formation of the corresponding horns on this pardoned being of your nature." One by one, all the members of Beelzebub's tribe touch the rod. The length of time is indicated by the captain of the Karnak because, one presumes, their ardency and reverence is such that some, perhaps all, might lose their horns entirely. We learn from this not only the need for a demonstration of gratitude and self-sacrifice, but that in terms of materiality there is not a making of more materiality, there is only an exchange of its gradations. There is so much more that can be received from the chapter, a mere 10 pages in all. Being only an interpretation, this essay cannot be a substitute for the direct experience of self-initiation which can only be had by one's own active reading and pondering.